Amid the chaos of the Japanese attack on Pearl Harbor, Hawaii, 76 years ago this morning, there was no shortage of bravery, as sailors, soldiers, airmen, Marines and Coast Guardsmen overcame shock, uncertainty and fear to find something greater within themselves: a grim determination to survive and an unwavering resolve to fight, the commander of the U.S. Pacific Fleet said today. 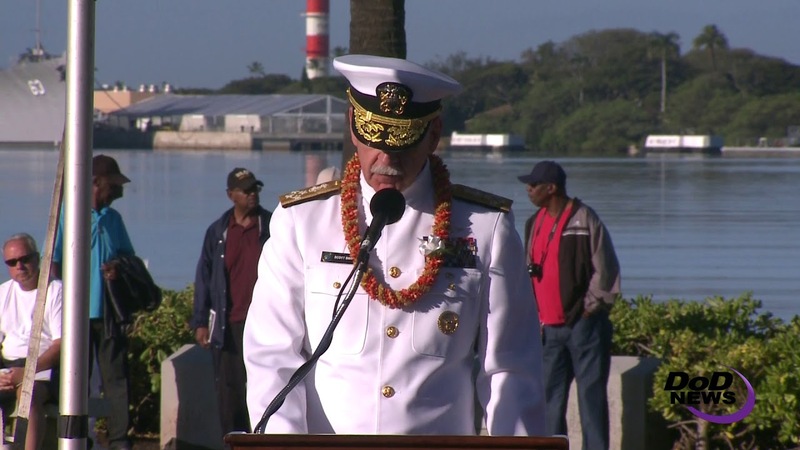 At the 76th National Pearl Harbor Remembrance Day Commemoration, Navy Adm. Scott H. Swift told an audience of World War II veterans, Pearl Harbor survivors, families and friends that American service members stationed at Pearl Harbor that day in 1941 were heroes. "Unsurprisingly, … none of these heroes considers themselves as such," Swift said. "They all say they were just doing their jobs. I guess that is true if just doing your job entails 15 Medals of Honor and 51 Navy Crosses being awarded -- many posthumously – [and] all of which highlights the valor displayed that morning 76 years ago today." The USS Ward, a destroyer, which had been decommissioned for two decades after World War I and brought back into service in January 1941, was the first U.S. Navy ship to fire a salvo at the Japanese after their attack on U.S. forces at Pearl Harbor, he said. "The crew was made up primarily of enlisted reservists from the Midwest who previously honed their seamanship skills on the Great Lakes and the Mississippi River," Swift noted. "Both ship and crew had been activated as part of America's leadership effort to prepare for potential hostilities, but peacetime training can never be as trying as operating in war. Ward's performance that morning was exceptional. I'll take a moment here to highlight how her story still speaks volumes to our fleet today." 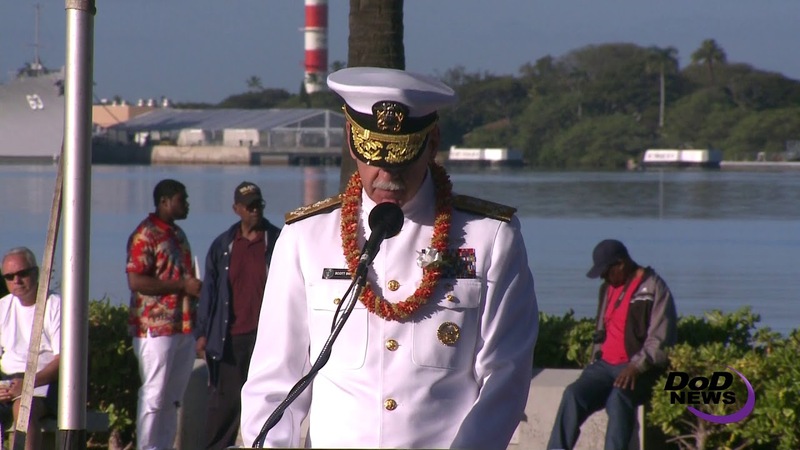 America's experience at Pearl Harbor reminds us we cannot be trapped by our most recent historical events -- that the heroes with us today ensured Pearl Harbor would not be the end of the story, the admiral said. If that had occurred, he added, it would have been a gloomy day, but the sweeping defeat there that morning 76 years ago was short-lived. "Instead of retreating from the fight, America's Pacific Fleet dug in its heels," Swift said. "Along the way, they forged a cultural heritage of resilience that sailors continue to draw upon today. Indeed, America's sailors, civilian sailors and members of all military branches made sure that the adversary intended as the first and last battle of a short war was only the opening act." Within days, he said, Pacific Fleet submarines launched offensive patrols, taking the fight to the enemy. Likewise, fleet cryptological analysts Stage Station Hypo refused to give up, despite earlier setbacks that failed to foresee the attack. "Instead, they redoubled their efforts to break the Imperial Navy's code to anticipate the adversary's next move," Swift said. "All along the waterfront, dive and salvage crews, shipyard workers and ship's company labored around the clock to save lives and resurrect the vessels that they could." Across the island and across the United States, Americans were rising to the challenge, he said. "Within six months, the critical victories at the Battle of Coral Sea and Midway, the Pacific Fleet sailors and civilian sailors had delivered a blow to the adversary that shifted the momentum of the war, thanks in no small part to Station Hypo's dogged tenacity," the admiral said. "By the end of the war, Pacific Fleet submarines had conducted 488 war patrols, and were responsible for more than half of all enemy ships that were sunk." Swift thanked the Pearl Harbor and World War II veterans "who yet carry the burden and bear the scars of those fateful days." "We honor you today for the proud cultural heritage of victory and toughness that you have bestowed on each of us that now wear the uniform in your honor," he said. "We remain forever in your debt." The admiral noted the strong bonds that have formed between former bitter adversaries. "I cannot help but note that just as the crew of the USS Ward was not caught unprepared by peacetime mentality, likewise the Pacific Fleet was not trapped by fear and uncertainty following the attack that morning," he said. "And at the war's end, American and Japanese leadership did not remain bound by our former wartime hostilities, but instead chose to forge a new future of reconciliation that has benefitted both of our nations, and indeed the entire Indo-Asia Pacific region, in incalculable ways." Dec. 7 holds a number of hard lessons that no sailor of any nation should have to relearn, Swift said. "Though the wounds dealt here of more than seven decades ago are fading," he told the commemoration audience, "we will never forget the valor, heroism, wisdom and leadership displayed by all those who gave their lives here 76 years ago."